The following article was written by Anna Brismar, founder of Green Strategy Sweden. Anna works as sustainability consultant within the fashion and textile field, with extensive expertise in the area of water, environment, and sustainable development. Anna has been a member of AtKisson Group since 2015. It is a common perception among conventional economists that the world’s economies, especially in developing regions, depend on continuous material consumption and production in order to keep societies and their markets alive and growing. Thus, instead of decreasing the production and consumption of goods, CEO Karl-Johan Persson places his hope in innovation: “So the challenge is doing it in a way where you still can have economic growth and jobs creation, while finding the innovations that can limit the damage to the environment”. The greatest opportunity, he continues, lies in the circular economy, which enables companies to move away from the current linear system of produce, use and throw away. This is where H&M’s investments in global take-back schemes and textile recycling come in, which are indeed important parts of the equation. 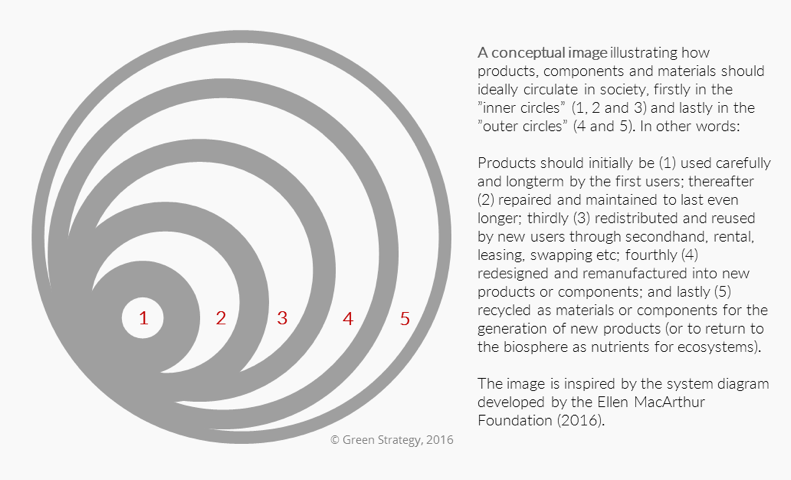 In other words, a key feature of a circular economy is the design of durable products that can be reused and “shared” by many users, as illustrated by the inner circles (See Figure 1 below). Innovations in the field of textile recycling are thus only one aspect along a spectrum of innovations and new strategies that will be needed to developing a more circular fashion industry. At another side of the spectrum lie design practices and production processes that enable more extensive use of biodegradable materials, non-toxic substances, renewable energy, as well as effective use of water and other resources, preferably in closed loops. In a circular fashion industry, fabric recycling belongs to the last stage of a garment’s lifecycle, as illustrated by the outer circle (see Figure 1). In conclusion, an ambition to limit our environmental damage will unfortunately not be enough to avoid catastrophic environmental events. Our industries need to drastically change the predominant business model of “take, make, dispose”. We need to shift from manufacturing good-enough products in large volumes with fast turnover that are sold and hopefully recycled, to instead creating long-lasting products in on-demand volumes that will be cared for, used actively over long periods of time, shared by many users, with components recycled for new uses, and with material recycling being the last option before composting or incineration. This could summarize the basic logic on which future investments should ideally rest. Note: This article is by no means a critique of H&M’s or any other company’s work and ambitions in the field of sustainability and circularity. Instead, it is an attempt to take a critical view on conventional economics’ approach to growth in light of the circular economy and planetary boundary paradigms.